Sorry it's taken me so long to get the rest of the instructions to you! It's been one busy month!!! I got to review some fun things from Serendipity and I also got to play with the manufacturer kit from Crop Addict...I LOVE that kit! I can't wait to show you the projects I did with both of those. I'm really proud of them this month! I have a lot of other layouts to show you too but I wanted to get the instructions done for you...especially for those who bought the I Deserve It All kit this month from Serendipity. So...here ya go!!! Photo corner punch: Stampin’ Up! 1. Photos are 5 x 7, 3 x 5, 1 ¼ x 1 ¾ (there are 3 of these). 2. Cover slide mounts with stripe paper and ink edges. Adhere small photos to back. Punch out small flowers from glitter paper and doodle a flower center. Adhere to corners of slide mounts. 3. Trace scallop frame on back of glitter paper for the 3 x 5 photo. Cut out and doodle around edge. Adhere photo on top. Adhere to the birthday cake image on the Sing paper. 4. Adhere 5 x 7 to upper right-side of paper at a tilt. 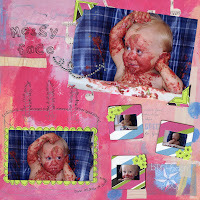 Punch photo corners out of glitter cardstock and stripe paper and layer. Doodle on glitter cardstock corners and adhere to photo. 5. Adhere rhinestone arrow (cut the strips apart to be able to place them the way you need) from the title area over to photo. 6. Use Cosmo Cricket rub-ons for title. 7. Adhere slide mount frames in the bottom-right corner. 8. Journal around birthday cake.